Good Morning Friends, hope you're having a Spooktacular week. Today I have the pleasure of introducing you to a fairly new and talented blogger from A Green Paintbrush. 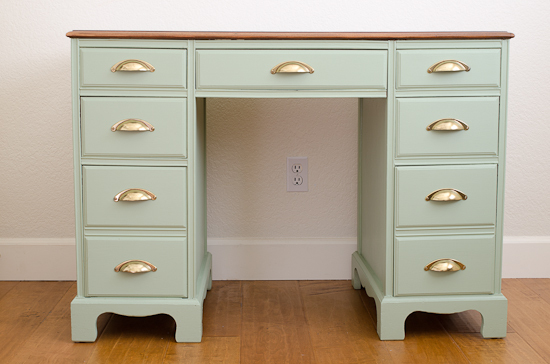 Her tagline is rescuing and rehabbing furniture one piece at a time and today she's sharing a gorgeous Vintage desk makeover with sage advice with you today. So without further ado, please welcome Barbara. 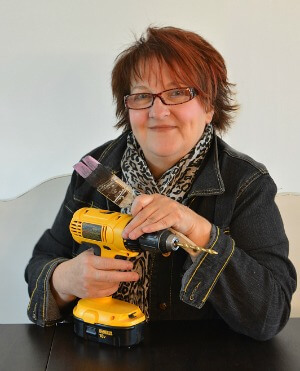 Hello, readers of The Interior Frugalista, my name is Barbara and I live in Sonoma, CA, in the US of A. I have been following Marie on her fabulous blog for quite some time and I am so thrilled and honored to be one of her guest bloggers. I have been painting furniture for a few years but only recently took the plunge into furniture rehab blogdom. 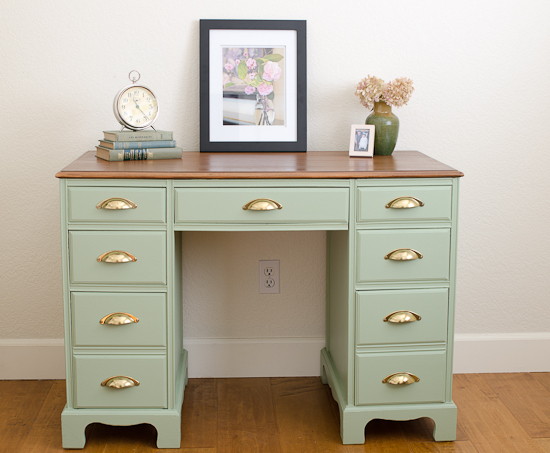 You can find me at A Green Paintbrush where I chronicle my furniture and paint adventures. A few months ago I found this desk on Craig's List and after working on it, am really happy with its end result. 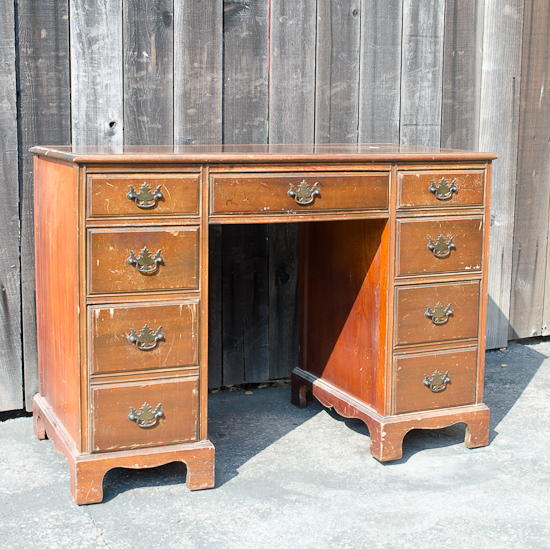 The seller told me that he had inherited the vintage desk from his grandmother. He had a real sentimental attachment to the piece, but now no longer had room for it. 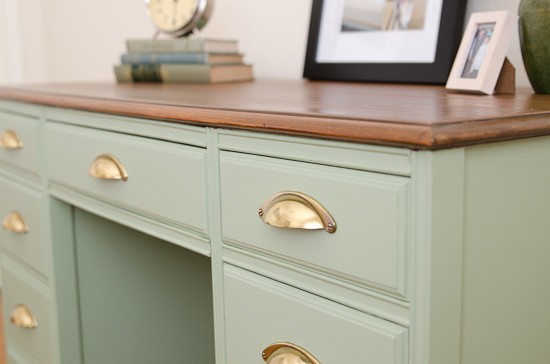 I knew that with some of my paint love, this desk could have a new life for someone else. The wood had a lot of scratches, but structurally, the desk was stable and sturdy. The drawers worked perfectly. To begin with, this desk got a good cleaning to remove the dirt, dust, and cobwebs. 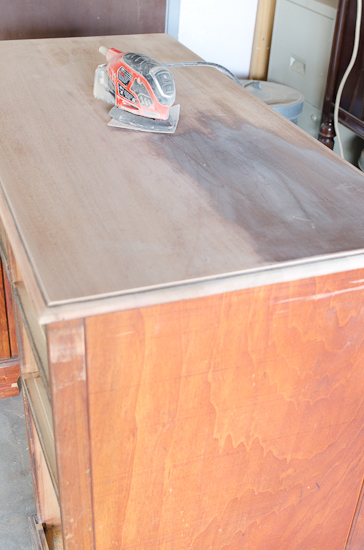 I knew that I wanted to keep the top in a restained wood, so out came my power sander to remove the previous old and tired looking wood stain -- dust, dust, and more dust. After another cleaning, the fun part could finally begin, i.e., the painting! 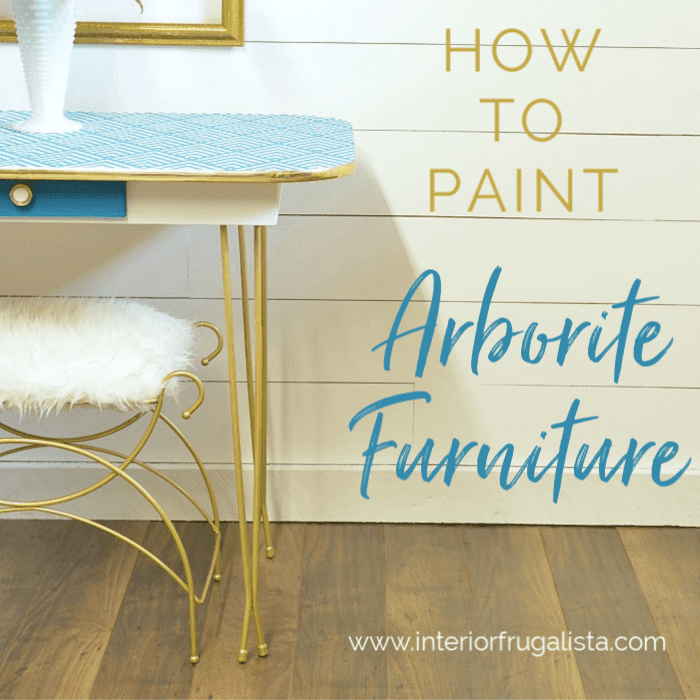 I use chalk paint on my furniture projects and though I've read time and time again that no priming is needed, I am just a priming kind of gal. And so, I began with a coat of Zinsser Bulls Eye 123 shellac/primer. 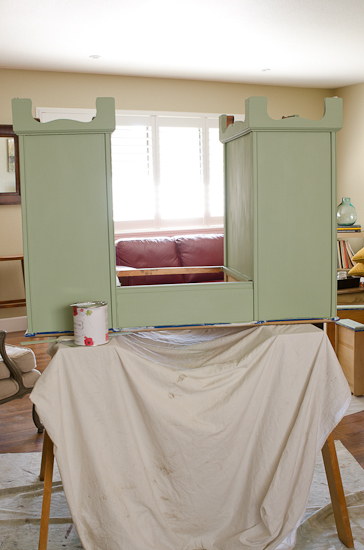 Once I had a dry primer base, I was eager to try a new to me shade of color on this piece by Country Chic Paint called Sage Advice. I'm a fan of CCP -- I love how smoothly it applies. 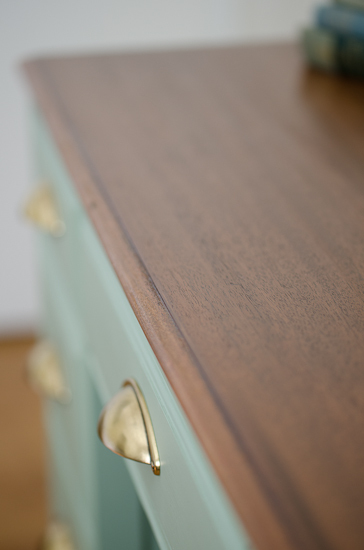 I ended up giving the desk two coats of sage advice and with it, achieved a lovely depth of color. After the painting came the finishing details. 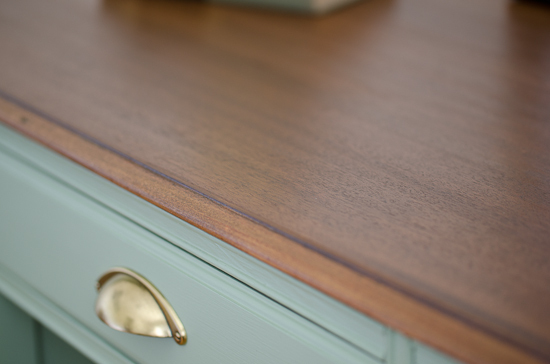 For the desktop, I applied General Finishes Gel Stain in Antique Walnut. I found that only one coat of stain was needed in order to bring out the beauty of the original wood. 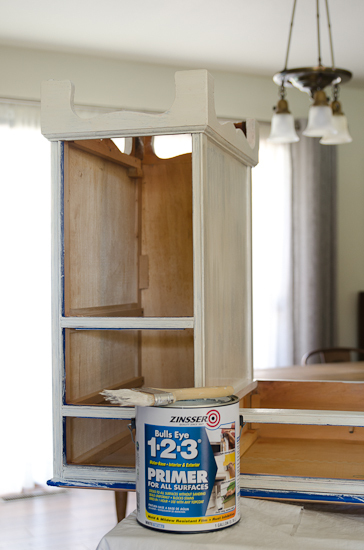 The stain was sealed with two coats of Country Chic Paint's Tough Coat. Next, the body of the desk was sealed in a coat of Natural Wax, also made by CCP, and then buffed and buffed to a shine (tired arm muscles). I was not a fan of the original "batwing" hardware. 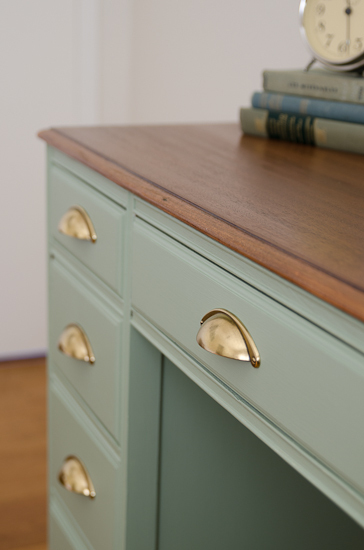 I found these gold plated pulls online at D Lawless Hardware. Once I installed them, I immediately knew that I had added the "piece de resistance" for the desk -- I just love what they bring to the overall look. Thank you, Marie, for this very enjoyable time with your readers. 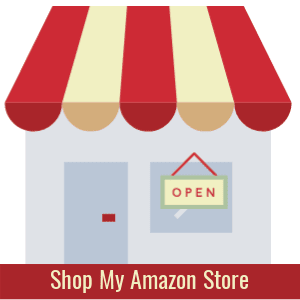 Thank you so much, Barbara, for generously helping me out during my surgery recovery and sharing your talents with my readers! 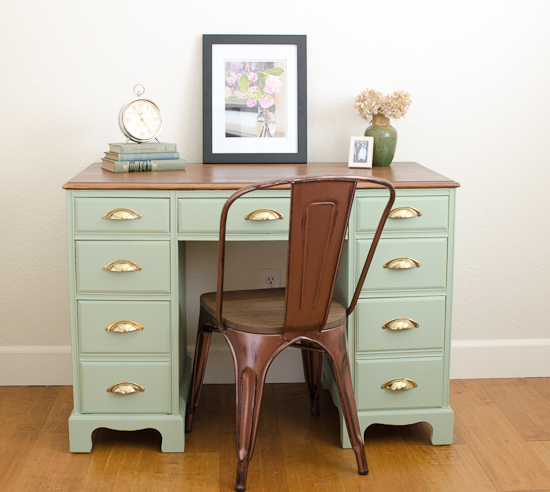 I absolutely love what you did with this desk, from the paint color to the stained top, drawer pulls and that fabulous bronze metal chair you paired it with. I have no doubt this desk is going to sell quickly for you. Dear friends, I urge you to pop over to A Green Paintbrush to give Barbara a warm welcome. Every Friday she has a blog series called Friday Fotograph that is worth checking out.